Congratulations to Profs. Jake Abbott, Yong Lin Kong, Kam Leang and Ken Monson on their new $2M NSF EFRI Award, project in collaboration with R. Rajamani of Univ. of Minnesota and O. Pak of Santa Clara Univ. 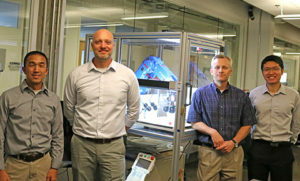 The vision of this collaborative project between the University of Utah, the University of Minnesota, and Santa Clara University is to extend the capabilities of clinicians by enabling minimally invasive access to locations in the human body that are currently difficult or impossible to reach, using a new class of 3D printed magneto-electroactive soft, continuum, compliant, and configurable (MESo-C3) mesoscale robotic devices that will travel along the natural pathways of the human body for a wide range of diagnostic and therapeutic applications. This includes a new breed of tethered and untethered soft endoscopes, catheters, and minirobots with diameters of ∼0.1-10mm that will address limitations of current clinical and benchtop devices. MESo-C3 will fundamentally change medical devices that currently involve pushing, pulling, or screwing through the lumens of the human body to devices that actively wiggle and assist in their own propulsion and maneuvering. The knowledge and technology created in this project have the potential to significantly impact healthcare across the globe. Cancers of the gastrointestinal (GI) tract are some of the most common and most deadly, and the likelihood of survival is significantly increased with early detection, yet our population is still woefully underscreened. MESo-C3 could make GI-tract screening safer, less expensive, more effective, and less intimidating to patients. Many disorders of the brain are difficult or impossible to treat due to the brain’s fragility and complex structure. MESo-C3 could enable safe access to currently unreachable areas of the brain, which could fundamentally change our treatment and understanding of what is arguably our most important organ. In addition, the knowledge generated in the area of additive manufacturing will have impact far beyond MESo-C3. The project also provides research opportunities for undergraduate students, involves presentations to large numbers of high-school students, supports a new summer-camp outreach activity to the underrepresented Pacific Islander community, and involves industry and medical experts. Magnetic propulsion that is simple in terms of fabrication and control compared to previous mechanisms for crawling in tubes, which easily lends itself to being incorporated into small, functional capsule- and catheter-shaped medical devices. A variety of modeling tools with varying levels of fidelity and computational costs will be devised to elucidate the propulsion dynamics and support the design and optimization of the MESo-C3 robots at different stages of the project. Innovative approaches for EAP-based morphology control to enable intelligent reconfiguration, manipulation, and steering of MESo-C3 robots. Supercapacitive sensors designed for use in body-fluid environments, and capable of measuring shear and normal forces on the robot, strains at critical locations, and elasticity moduli of grasped objects. The advancement of multiscale, multimaterial 3D printing via fundamental studies of soft-matter physics and materials development to enable the creation of mesoscale hybrid devices, which seamlessly integrates with the development of the key technologies in aims 1 through 3.